We offer a range of hygienic and thorough nail services for beautiful hands. 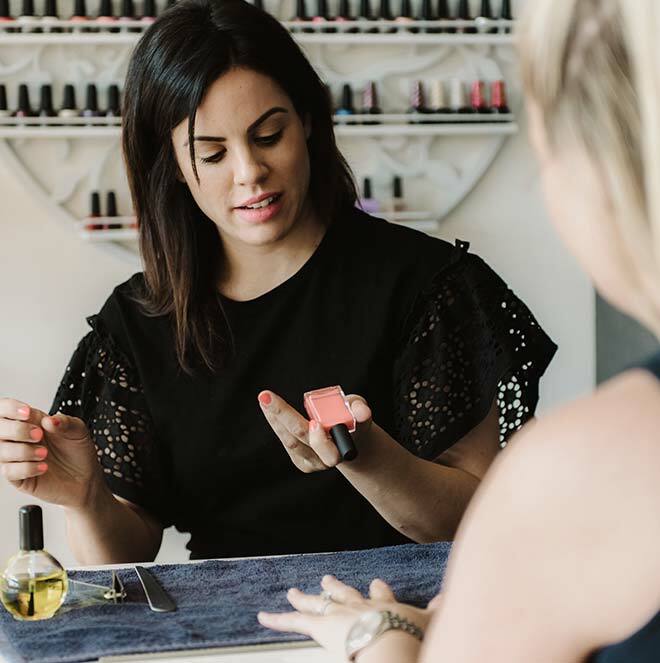 We use classic techniques to refresh your nails, pampering massage to nourish and soothe and the perfect polish application to get your nails looking their best. Our range of polishes includes OPI classic, longer lasting CND Vinylux, OPI infinite shine and Artistic colour gloss gel. A little fuss, file and polish for gorgeous divas on the go. Gets the nails looking presentable and ready for a special occasion or every day glam. An indulgent treatment for pampering tired, frazzled hands and nails. Includes soak, file, shape, cuticle work, buff and smooth before the perfect polish is applied. Includes nail shape and buff before polish is applied and set under a special gel curing lamp. The result is chip free, glossy and long lasting polish.